It doesn't take a long list of statistics to convince you that our world is broken. Mission trips, service projects, and supporting children through relief organizations are just a few of the ways that many youth workers engage their students in serving the least, the last, and the lost. As good and helpful as these things may be on the surface, that's where they remain-at the surface. The problems run far deeper than an occasional paint job or fundraising project can solve. But it's not hopeless. Deep social justice is possible in your youth ministry.Following their bestselling book, Deep Ministry in a Shallow World, Kara Powell and Chap Clark provide you with research and insights that will help your ministry get to the next level. In addition to helping you further understand the Deep Design method (introduced in their previous book), their practical Kingdom of God theology will help you go beyond simply trying to motivate your students to serve those in need, and invite your students (and maybe even your leaders) to wrestle with why those people are in need in the first place. You'll hear from well-known social justice leaders and youth workers who are making a difference in urban, suburban, and small town settings including: Jim Wallis (Sojourners) Tony Campolo (Eastern University) Lina Thompson (World Vision/Vision Youth) John Perkins (Christian Community Development Association) Shane Claiborne (The Simple Way) Larry Acosta (Urban Youth Workers Institute) Rudy Carrasco (Harambee Christian Family Center) Jeremy Del Rio (Community Solutions, Inc.) Noel Castellanos (Christian Community Development Association), and more In addition to expanding your personal justice commitments, Deep Justice in a Broken World will help you reflect with your own leadership team, and will provide you with online resources to take you even deeper into the journey. So go ahead, dig deeper into what it means to heal the broken world in which we live. 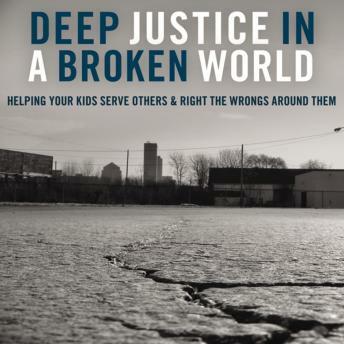 Take your ministry deeper into social justice.